Both Chapter 7 & 13 are designed to provide debt relief for borrowers seeking help from overwhelming debt. However, there are many key differences between a Chapter 7 and Chapter 13 bankruptcy. It is important that you speak with a bankruptcy attorney before you decide which type of bankruptcy to file. Each form of bankruptcy will have its own unique benefits and disadvantages. An experienced bankruptcy lawyer in Tampa can explain each form of bankruptcy and help you decide which chapter would be best for your specific situation. If you are contemplating filing for bankruptcy, contact a bankruptcy attorney at Florida Law Advisers, P.A. to schedule a free consultation. During the consultation we will answer your questions and provide you with a comprehensive strategy to help solve your financial crisis. We are experienced and skilled in all bankruptcy matters; regardless of whether you need help with Chapter 13, Chapter 7, Chapter 11, or alternative forms of debt relief, we can help. In many cases Chapter 7 bankruptcy is more beneficial to borrowers than Chapter 13 bankruptcy. Chapter 7 is a liquidation bankruptcy, which means a debtor (borrower) may be required to sell certain assets during the bankruptcy. Not all assets will be subject to liquidation due to certain Florida bankruptcy law exemptions. If an asset is exempt the debtor will be able to retain ownership and not be ordered by the court to liquidate the asset. In some cases, a borrower may not even have to liquidate a single asset because of the Florida exemption laws. The type of property you own and the exemption laws will play a significant role in determining whether Chapter 7 or Chapter 13 is the better choice for your case. If your assets are not exempt, you may be better off filing for Chapter 13 where you will not be required to liquidate any assets. 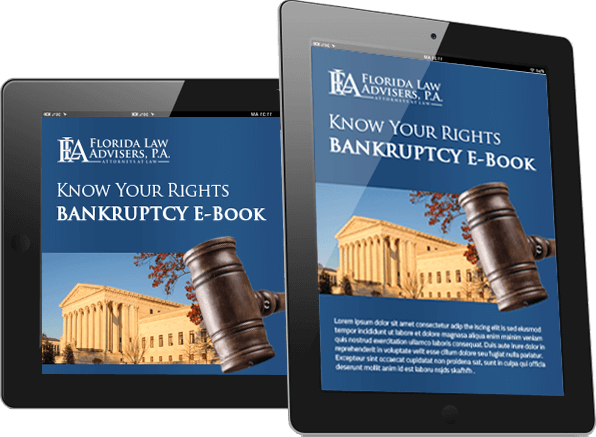 If your assets are not exempt under Florida bankruptcy law you may want to file for Chapter 13,instead of Chapter 7 to avoid liquidating your property. Chapter 13 is a restructuring bankruptcy, instead of selling assets to pay creditors you create a payment plan to pay back the amount owed. The amount that will have to be paid back to the creditors is largely based on the disposable income you receive each month. Disposable income is calculated by deducting your monthly expenses and cost of living from the income you receive each month. The payment plan will usually require a borrower to pay all of their disposable income for the next 3 to 5 years toward the debts included in the bankruptcy. If the borrower complies with the terms of the bankruptcy any balance still due on credit cards and other unsecured debt at the end of the bankruptcy will be discharged. Unlike Chapter 7 bankruptcy, Chapter 13 debtors will not have to pass the Means Test to be eligible. The Means Test requires a borrower’s monthly income after specified deductions to be below the Florida adjusted median income. In Chapter 13 cases the Means Test is not required; however, a borrowers secured debts must be less than $1,081,400 and their unsecured debts must be less than $360,475. We understand these are very difficult times for you and we are here to help. We have many options available that can help you successfully manage your debt and regain your financial health. We will explain each option to you in detail and help you make a decision that is best for you and your family. Our initial consultation is free and we offer flexible payment options to all of our clients. At Florida law Advisers, P.A. we want to provide you with solutions, not add to your financial burden. We will work with you to develop a payment plan that you can afford. We accept many forms of payment and offer our bankruptcy clients the choice of either a low cost flat fee or low cost hourly fee for bankruptcy representation.